Drop Pod Templars -- The 'How To'! One of the last remaining remnants of goodness in the Black Templars codex is our ability to Drop Pod. "What? Doesn't every Space Marine army do that?" is what you might ask. 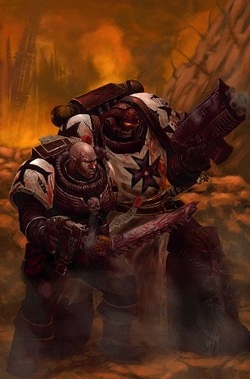 Yes, but the Black Templars do it better! Because we've not been re-released yet, we retain the 4th Edition rules for Drop Pod Assault. And in the current format, its far superior to the newer rules. Why is this so? To put it simply, its because our rules don't force half of our drop pods to come on the board turn one while the rest remain in reserve. This allows your opponent to concentrate their full collective firepower on only half of your army. As you can imagine, 50% strength forces will end up severely mauled against 100% sized armies, leaving you to play catch up the rest of the game. While there are some tactical uses for new SM codices to have a couple drop in early game, it is only feasible if you only have a couple pods. However, we don't have that problem. No matter the number of pods we take, we always stay in reserve until at least turn two. This allows us to come on at our own pace and prevents our opponent from getting off a good Alpha strike off against us. Opponents are quite hard pressed to destroy Space Marine forces in a full length game. Just imagine how difficult it will be when they have 2 less turns of shooting to do it? Opponents also cannot guarantee that we'll be coming down first or even second turn like they can for the newer Space Marine codices, so they will either castle up in a corner (which is disadvantageous in objective games), or will be spread all over the board trying to capture objectives before you come onto the board. If the former, we will have control of most of the board from the beginning. Against the latter, it is easy to separate portions of your enemy's force from their support and we'll have a much easier time destroying those elements. The key to using a BT Drop Pod army is to keep the unit sizes down. Everything has to follow the Multiple Small Unit (MSU) theory in order to be effective. Because of deep strike rules, a unit that pods in counts as having already moved. That unit is also not allowed to run or assault. So the only thing the squad can do is fire rapid fire weapons at 12", assault weapons, or pistols. The next turn, you will likely face some significant firepower as they try and wipe the squads out. The problem with having fully sized and equipped units, is that they will take heavy losses. Especially your expensive units. Don't you think its better to present 3 minimally geared units rather than 1 decked out squad? I do. Because they will spend all their time shooting at the one squad if it exists, adversely, would have to decide which one to fire at if you had 3. Plus, you have more tactical options to having 3 units over the 1 decked out unit. However, minimally geared does NOT mean undergeared. Having a 5-man Crusader squad armed with only a meltagun/boltguns is perfectly acceptable. It provides excellent anti-tank firepower and decent anti-infantry fire, while presenting a very cheap unit to your opponent. They destroy it? Who cares!?! Full Drop Pod. Check. MSU. Check. Whats next? The list! As I said, you need to have multiple small and minimally geared units. But that's not the only thing you can do: fielding redundant semi-expensive ones works just as well. For example, if you want to take dreadnoughts in the army, you should have three that are exactly the same. They aren't cheap, and will have every AT weapon trained their way the second they land. The only way to defend against that problem is to present multiple targets. Another example is terminators. Very expensive by themselves, but they can be exceptionally effective when used right. Once a unit of these guys hits the battlefield, you better believe that your enemy will do everything in their power to kill them. If you have three exact units, their survivability increases exponentially. They certainly cannot kill them all if you've taken care in their deployment. As with every army, you need to have balance. The ability to take on all comers is incredibly important and as such, the army needs to have the ability to deal with both infantry and vehicles. That means additional fire support. Fortunately for us, Land Speeders fit this role perfectly. Able to deep strike into the battle with the drop pods, they can lay down suppressive AT or AI fire at your discretion. They should always be taken in a DP army. Always. So now that you have a list, how do you go about using it? Depending on the scenario and opponent, you will often start getting units on to the board on turn 2. When you come on the board, you do in one of two ways. The first, if you're fielding close combat units (i.e. terminators), you have to drop them into the face of whatever unit that needs to die. You want to drop them on the ends of the enemy squad, hopefully providing cover from whatever shooty elements your opponent has. Think of a dumbbell. The weights at the end are your unit and your enemy's shooty unit. The bar in between the weights where you grip is the target enemy squad. Because there is a unit in between, you get the nice 4+ cover save against potentially low AP weaponry. But what if you don't have a close combat squad dropping in? Well, if you need to blow some mech and have a melta user (including melta dreadnoughts), drop it as close as possible to the vehicle needing to die. Obviously the position will depend entirely on the situation, but generally, you want to be as close as possible to the rear armor. Alternately, you can drop those units in close to a weak armored foe and rapid fire them to death with your bolters. However, if none of the above options are appropriate, you can castle up the Drop Pods to provide a defensive "wall" of sorts. This can help block or slow down vehicle movement, as well as infantry advance. Using a tactic like this is especially useful in objective games. Finally, because you have lots of units to go around, you are able to at the very least contest every objective on the board. More than likely you'll be securing your fair share of them with your troops. Your opponent will be hard pressed to overtake you on those objectives, and will have to devote significant resources into doing so. With so many positives to the army, why doesn't everyone play them? As I previously mentioned, these types of armies are extremely vulnerable to enemy firepower. If you cannot get proper positioning of your pods, or scatter too far off course, some of your expensive units might find themselves shot to pieces before they can even move! Then you have the fact that in Kill Point missions, Drop Pod armies provide huge amounts of KP to your opponent, because of the massed MSU we've followed. Drop Pods are also exceedingly easy to destroy. Its not too difficult to penetrate a AV 12 vehicle, but because it counts as Open-Topped, your opponent has a +1 to their vehicle damage rolls! Even glancing hits can knock it out of commission! And lastly, drop pods are not exactly cheap to buy. You need lots of them, and at $30 a piece (or about $80 for a Forge World dreadnought Drop Pod), you'll be paying a pretty penny for them. Quite an expensive army, but if you have disposable income, they are a great army to play! If you're looking for more BT Drop Pod tactical articles, take a look at my 'How To' for my "Defensive" Drop Pod list. May the Emperor guide you!